On behalf of the Karl May Foundations, the Karl May Society is publishing the historical-critical edition of Karl May’s works. It provides a reliable basis for academic work on Karl May’s original texts. Depending on the literary records available, manuscripts, first editions, authorised reprints and final editions are used. An editorial report is published for every volume – in the last volume for multi-volume works – which contains all relevant details on the origin and creation of texts. In a supplemental series, selected facsimile editions of important manuscripts, rare prints and other materials on Karl May’s works and impact are published. The volumes of the historical-critical edition are available in our museum shop or online. You can find more information and the edition schedule at www.karl-mays-werke.de. 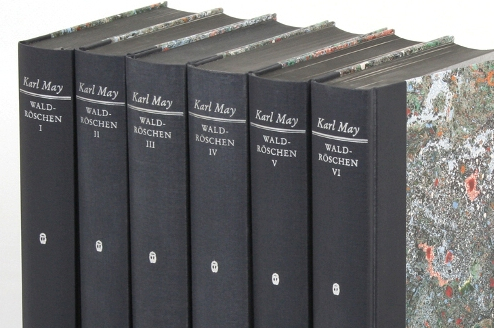 The historical-critical edition of Karl May’s works: "Waldröschen oder die Rächerjagd rund um die Erde"